Nikon has finally announced their entry into the expanding world of mirrorless digital cameras with the V1 and J1 cameras. PhotographyUncapped has reported on this coming addition to the Nikon line in a recent post: Nikon Mirrorless Camera Rumors – Will Canon + Nikon Keep Up With the Market Shift Away from Pro DSLR’s ? With the growing popularity of mirrorless cameras produced by other brands, Nikon has been just a wee bit late in jumping into this market. The mirrorless cameras are smaller, lighter, and quieter than the standard DSLR versions used by pros and enthusiasts. By not needing the move the viewing mirror out of the way just before each shot, the mirrorless cameras can be an improvement in simplifying the mechanics of digital cameras. Amazon Pre-Order Now – Immediate Shipping upon Nikon Release. MELVILLE, N.Y. (Sept 21, 2011) – Nikon Inc. today announced a revolutionary new digital imaging system built from the ground up to empower users with new ways to tell stories through photography, driven by imaginative next-generation technology. The iconic new Nikon 1 system is designed to become one with the user and their lifestyle, providing a unique form of expression with amazing image quality, speed and portability. From Nikon, a company with more than 75 years in imaging excellence, the Nikon 1 J1 is an advanced camera with interchangeable lenses that opens the door to a fresh way to capture pictures and High Definition (HD) movies. This Nikon 1 system represents a new category of camera that challenges conventional thinking, emphasizing a pocketable form factor with unbelievable speed, combined with the high image quality that only Nikon could create. Thanks to a wealth of innovative technologies, the Nikon J1 camera is a simple to use conduit for creativity, seemingly anticipating a consumer’s needs in any situation. Moments are instantly captured using amazingly fast new hybrid Autofocus (AF), and blazing fast speed with continuous AF. Users can also shoot with confidence knowing that the Smart Photo Selector will automatically capture the best possible image without a second thought. Furthermore, just a touch of the shutter button instantly captures a high quality image while simultaneously recording Full HD 1080p movies, and the exciting new Motion Snapshot mode captures fleeting moments like never before with a combination of moving and still images, bringing memories to life. To accompany this exciting new form factor, Nikon created the entirely new 1 NIKKOR lens system that seamlessly integrates powerful precision optics into a camera platform to capture more of the world around the user. The new Nikon 1 system is a completely original concept, engineered specifically to strike the ultimate balance of performance, intuitive simplicity and portability to chronicle life like never before. This breakthrough platform lays the foundation for future technologies, and the Nikon 1 system has been created for the consumer who wants to capture, share and connect to life. The fully electronic lens system enables the camera to keep pace with an active lifestyle and delivers amazing images and Full HD 1080p movies to connect with friends and family. Whether it’s a spontaneous outing or a planned trek abroad, the versatility of interchangeable lenses in a convenient form factor will allow a consumer to take the camera with them wherever life leads. Furthermore, the J1 camera makes a personal style statement with a variety of matching colored camera bodies and lenses. The heart of the new J1 camera is the new Nikon developed CX-format, 10.1 megapixel High-Speed AF CMOS sensor that helps make this camera the pinnacle of portable performance. The newly developed CMOS sensor has been engineered for amazing image quality in a variety of lighting conditions, with a native ISO range of 100-3200 (6400 Hi-1) for maximum versatility. Images captured with this new sensor exhibit striking colors, vivid hues and rich detail so lifelike, it’s the next best thing to being there as memories unfold. Nikon’s exclusive new EXPEED 3™ image processing engine drives the system and is the catalyst behind the camera’s rapid response, fast AF and high-speed performance. In addition, the new dual core EXPEED 3 processor works to maximize battery efficiency while yielding images and movies with low noise and vibrant tones. The Nikon J1 is engineered for maximum ease of use, featuring a clean button layout and intuitive graphical interface. Distractions and menus are minimized; creating a clear path to the camera’s advanced functions, further unleashing creative potential. From first steps to first date, life moves fast and the Nikon J1 is the camera to keep pace. The camera seemingly anticipates action with amazing autofocus, response time and operation. The new advanced hybrid AF system is the world’s fastest autofocus1, allowing consumers to capture more of their world than ever before. The Nikon J1 features new focal plane phase detection AF that reacts instantly to deliver incredibly fast, split-second response. Wherever action is happening in the frame, the 73-point AF system will get the shot. This newly developed hybrid system continuously evaluates the scene at hand for optimal results, and can switch between phase detection and contrast detect AF to best suit the scene. Whether shooting in low-light conditions like a late night block party, or a fast moving pick-up game, photographers can capture details with confidence. When the action is happening, users can also shoot at a fast 10 frames per second (fps), with full adaptive AF for frame after frame of images with incredible sharpness and detail. Additionally, the scene can be captured at full resolution up to a staggering 60 fps (AF locked), which is the world’s fastest continuous shooting speed2. So go ahead and capture a best friend’s high dive at the next pool party, and then confidently share every aspect of the leap with stunning detail. Motion Snapshot is a new approach to capturing images that will dramatically alter the way we perceive digital photography. By selecting the Motion Snapshot icon from the Mode Dial at the back of the camera, consumers can capture fleeting moments with staggering depth and emotion like never before. The result unites a frozen still image with a slow-motion movement set to a built-in audio soundtrack to create a portrayal of an occurrence with maximum impact. With Motion Snapshot, users are now able to relive memories in stunning detail, as real movement and depth are included in the image. Motion Snapshot provides a way to once again experience someone’s hair flowing in the breeze or relaxing scenes like waves crashing or rustling leaves that evoke an emotional response. Both the camera technology and exterior design were inspired by the pursuit of balance, as a device that lives in perfect accord with any lifestyle. The lines are clean and minimalist, the colors are vibrant, creating a stylish accessory for every personality. The design is meant to inspire creativity, with a simple interface and easy-to-use camera controls, intuitively placed for any user. Switching from modes and accessing advanced features is easy, enabling the user to further push creative boundaries, whether trusting the smart automatic settings or creatively exploring the full manual control modes. The new Nikon J1 is an advanced camera with interchangeable lenses that features new technologies aimed at creating better pictures, easier. Nikon’s new Smart Photo Selector feature strives to deliver a perfect image every time. When a “can’t miss” photo opportunity arises, users can switch to the Smart Photo Selector mode which uses the camera’s pre-cache to start shooting and storing images. All of these images are analyzed within the camera, and the best photo is selected based on a number of factors including exposure, focus and advanced facial recognition. While the camera suggests the best image, five frames are recorded, providing the user a choice of their favorite photo. What’s more, the J1 also includes favorite core Nikon technologies, such as Active D-lighting, Auto Scene Selector and Picture Controls. The new CX-format CMOS sensor produces breathtaking Full HD movies at 1080p (30 fps). Users can also shoot at a rapid 60 fps (1080i), or elevate the production with additional 30/60/400 and 1200 fps modes for super slow motion effects. The J1 is made to be flexible, and can capture both HD movies and high resolution images simultaneously. Simply press the shutter while recording to freeze the action with a high quality image file with sharp focus. The Nikon J1 is the model designed for those consumers who use a camera as part of their connected lifestyle; always carrying it to bring passion and depth to visual storytelling. Both the camera and the lenses come in a variety of matching stylish colors, including white, pink, red, silver and black. Photos and movies are easily composed and shared on the bright 3.0-inch high-resolution LCD monitor. With the aid of the concealed pop-up flash, consumers can easily add fill flash as needed or shoot in most conditions including low-light. 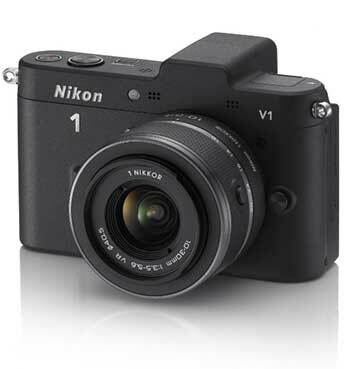 The Nikon 1 V1 is for photo enthusiasts who value interchangeable lens versatility and desire a small form factor. In fact, it’s the world’s smallest and lightest camera in the world with interchangeable lens versatility and an electronic viewfinder (EVF)3. Aimed at the user excited about creating amazing images and movies, the Nikon V1 has added features including a 1.4 million dot high resolution EVF that automatically activates when the user raises the camera to their eye. In addition to the high-speed electronic shutter, the magnesium alloy body conceals a high performance mechanical shutter that affords tactile feedback and expanded shooting options. The V1 camera also features Nikon’s new Multi-Accessory Port for attaching options such as the new SB-N5 compact speedlight, or the GP-N100 GPS module. For those making movies, the V1 has a stereo microphone input for professional quality audio. Building upon a 75 year legacy of NIKKOR lenses and optical excellence, the new 1 NIKKOR lens system has been developed to push the boundaries of what’s possible. Experience as the world leader in optical engineering has driven Nikon to create a compact, lightweight lens system that provides users with stunning image quality. New technology in these lenses includes a Silent Stepping Motor (STM) for whisper quiet AF and zoom during operation and while shooting movies. Additionally, this high performance system places Nikon’s VR II image stabilization technology inside lenses to minimize instances of camera shake. The result is sharp images in a variety of challenging lighting conditions, even while handheld. The new system offers a lens for every occasion. The camera kit includes a color-matched 1 NIKKOR VR 10-30mm f/3.5-5.6 lens (27-81mm 35mm equivalent) for optimal focal range in a small lens. For those needing maximum versatility, a 1 NIKKOR VR 30-110mm f/3.8-5.6 lens (81-297mm equivalent) is available, or users can explore their creative side with a color matched 1 NIKKOR 10mm f/2.8 pancake lens (27mm equivalent). For the movie enthusiast, a new 1 NIKKOR VR 10-100mm f/4.5-5.6 (27-270mm equivalent) power zoom lens will be available. This new lens is Nikon’s first powered zoom, and provides smooth and silent changes in focal length while recording movies. Additionally, the FT-1 F-mount adaptor for legacy NIKKOR lenses will be available in the future, so that photographers can utilize their collection of quality NIKKOR lenses. The Nikon J1 and V1 will be available throughout the United States beginning October 20th. The Nikon J1 camera with 10-30mm lens kit will be available at a suggested retail price4 of $649.95. The Nikon V1 camera with 10-30mm lens kit will be available for a suggested retail price4 of $899.95. For more information, please visit www.nikonusa.com. 3: Among cameras with interchangeable lenses with a built-in electronic viewfinder (EVF).